An RFID Transponder system consists of a reader and transponders. The transponder can be as simple as a single integrated circuit attached to a very simple antenna system and costing only a few US cents and yet containing many attractive features.This article explains the different features of the design of such systems. In 1991 the development of a protocol for Transponder systems has allowed the development of very low cost transponder systems offering good operating ranges, and being much lower cost than previous technologies. By operating in the UHF band (300-3000MHz), antenna systems can be simplified, ranges are measured in meters and semiconductor technology has advanced to such a point that all features can be integrated into a single integrated circuit. 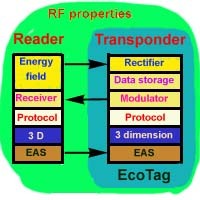 RFID transponder systems make use of the properties of radio frequency propogation. 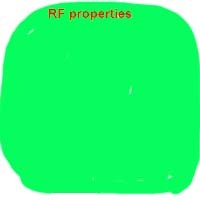 This allows energy to be radiated from a source and collected by a transponder which can reply by radiating its response. The performance of the RFID system will require that the correct RF design methods are used for the RFID system. It will also require that the systems operate on the correct operating frequency so that they do not interfere with other users. However thanks to recent developments, this RF design can be dramatically simplified and produced at low cost while still being as effective and not causing interference with other users. 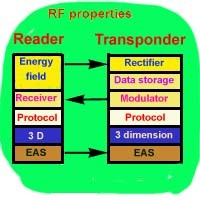 The transponder system comprises of at least one reader and one transponder. If a protocol function is provided then the system can comprise of at least one reader and many transponders. 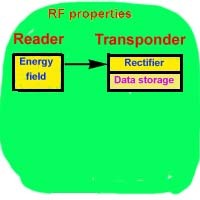 In order to keep costs of the transponder down, it is usual to power up the transponder with its energy requirements from a field radiated by the reader. 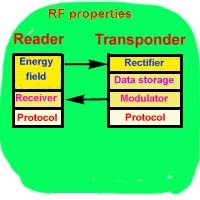 This category of transponder system which makes use of the reader's field powering up the transponders is known as "passive" transponder systems. 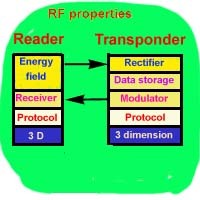 The reader radiates the energising field towards the transponders that it wishes to power up. The frequency of this radiated energy field will be set to the operating frequency allocated to the system and the power radiated will be within the requirements of the regulating authorities of that region.This is the only critical frequency component in the RFID system. In many cases different countries will specify widely differing operating frequencies, and it is desirable for the transponder to operate correctly at all the likely frequencies it might encounter. This ability to operate over widely differing frequencies (say 869MHz to 928MHz for EU/US trade) is called frequency agility. In this situation the readers that are based in the different countries are set to the allocated frequency in that country and the transponders respond correctly to any reader frequency they encounter which is within their operating band. 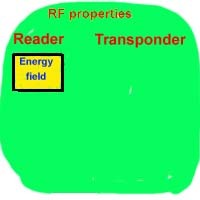 The transponder collects part of the radiated energtising field via its antenna. This energy is at the operating frequency of the reader. By using a simple diode and capacitor circuit, with diodes that are fast enough to operate at the operating frequency, the energy can be converted to DC voltage and stored in the capacitor for operating the transponder. More sophisticated rectifying circuitry can be used, such as full wave rectification or voltage doubling circuitry if needed. The transponder sends its data back to the reader in serial form. In the 1960's a development of a technology called backscatter modulation by the Lawrence Livermore Laboratories in the USA allowed for this communication to be implimented very simply and at low cost while keeping the required frequency agile characteristics of the transponder. On the transponder, a transisitor is switched on and off to vary the load on the antenna of the transponder in synchronism with the data to be transferred. This varying of the load changes the antenna matching and causes varying amounts of the energising field to be reflected back towards the receiver of the reader. The reader has a simple receiver comprising an antenna for collecting the returned energy, a mixer, and uses a signal derived from the energising field as a local oscillator. The data transmitted from the transponder is available at the output of the mixer for processing in a microprocessor. In the past when transponder's operating range was measured in centimeters, it was not too important to handle the situation of multiple transponders as it was difficult to get more than one transponder into the reading zone at one time. When operating ranges are measured in meters, it is highly likely that there will be more than one transponder in the zone at a time. Multiple transponders cause complications as there is only one communications channel to convey data from the transponders back to the reader, and if two transponders are communicating at the same time then the receiver detects a garbled message. Generally it is undesirable for the transponder to have an onboard receiver itself to detect traffic management instructions being passed from the reader to the transponders as this introduces cost penalties, causes temperature stability problems, and means that a single operating frequency would have to be assigned worldwide if the transponders were to be used for international trade. The transmission from the transponders is so weak that other transponders are not able to monitor transmissions from fellow transponders that might be broadcasting their identity. In 1991 the invention by Mike Marsh published in the patent called Electronic Identification System described a protocol that could allow a large number of transponders to be read by a reader without the transponder's requiring receivers onboard or tuned circuitry. This meant that cheap transponder systems for multiple transponders were practical. In 1998 Trolley Scan developed the Trolleyponder protocol, another protocol that could allow many transponders to be read at the same time with no tuned circuitry. The protocols are implimented by circuitry in the transponders and the readers which enable the relative components to manage the traffic and allow multiple transponders to be read at the same time. The development of the protocols have been major driving forces behind the sudden massive acceptance of RFID technology, especially the low cost variety. Advancements in this field could make RFID technology readily available like phones, Internet and other applications. The protocols are invariably the subject of patents and the solutions need to be licensed. There are a few other protocols such as treeing, and protocols where the transponder has onboard receivers to receive back instructions from the reader or those that only work close to the reader where the reader can saturate the transponders' tuned circuits. In the Trolleyponder protocol it is possible to read 1000 transponders in a zone accurately and quickly, even if they all have identical identity data, with very simple wide bandwidth transponders. RFID systems use radio propogations methods to convey energy and data. This limits their operation to situations where the energy can be transferred and where communication between the reader and the transponder can be achieved. One of the characteristics of radio propogation is that the polarisation of the transponder and the reader must be compatible. A vertically polarised reader signal will transfer energy to a vertically polarised transponder, but a vertically polarised reader will not transfer energy to a horizontally polarised transponder. Should the application have transponders of a known ordered polarisation then it is possible to correctly orientate the reader to meet the needs of the application. However in situations where the transponders are randonly orientated some of the transponders are likely not to be orientated correctly for efficient coupling. (e.g supermarket trolley). A recent invention has addressed this problem by adding some simple circuitry to both the transponder and the reader to provcvide full 3 dimensional scanning. Electronic Article Surveillance is the technology commonly used in retail systems to detect unauthorised removal of goods or shoplifting. Electronic Article Surveillance features come for virtually free in RFID systems and are a natural extention. By adding a simple one bit memory element to the transponder and some control circuitry to the reader, EAS features that are fully controllable are easilty added to the RFID system. Different countries have different regulations regarding the allowable power levels allowed for RFID applications in the UHF band. In order to get good operating distances it is necessary to have sufficient power in the energising field such that the transponder at the operating range receives sufficient energy to operate. For international trade, it is necessary that the transponders operate equally well in all countries. Regulations in Europe have set the maximum power allowed for RFID to approximately two percent of that allowed in the US. This means that tags that operate reasonably well in the US have a dismal range in the European Community. Despite the transponder offering the above features, it is practical today for the transponder to be made in a single integrated circuit for a few US cents. Readers are also simple and low cost. The technology for producing these systems is widely available and the barriers to entry for companies wishing to be producers of low cost transponders have beeen dramatically lowered compared to past situations.